Maine’s jagged coastline, with sandy beaches on the south and rocky shores Midcoast and Downeast, is 3,478 miles long (longer than California). With all 3,166 offshore islands included, the state has over 5,000 miles of coast. Maine’s maritime industrial heritage established many of the state’s communities along the coast and tidal inlets; other major towns and cities in the state were established along rivers. Ice caps and glaciers, which contain enough ice to raise sea levels more than 200 feet if fully melted, are substantially shrinking each year. The latest estimate by scientists is a sea level rise of at least 10 feet in the next 50 years in addition to predictions of more and more extreme storms. Portland Society of Architecture estimates that a 4-foot sea level rise would do $111 million in damage to Portland alone. Historic downtowns and neighborhoods throughout Maine, like those across the United States and the world, are already facing erosion and flooding from rising seas with higher surges, and stronger storms with greater precipitation. Such increasingly intense and frequent storms are causing irreversible damage to our coastal heritage. This new normal is pushing Maine and historic preservation into an era where current methods of revitalization and celebration of place are being met with the very real future of loss. - A hotel at Higgins Beach in Scarborough was destroyed by erosion. But now the threat is increasing, including to the rocky coast as well. 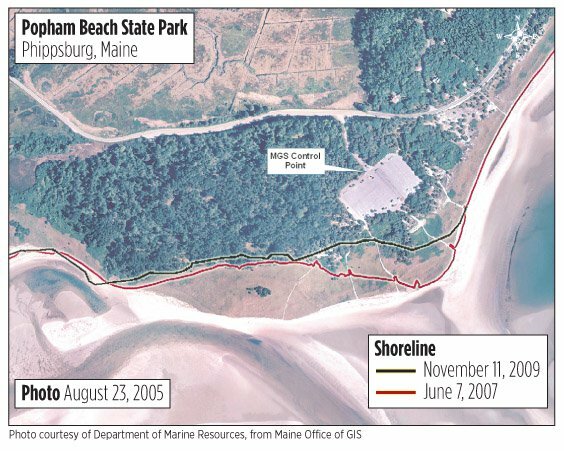 Maine’s coastal counties account for 77% of the state’s total employment, and if we do not initiate strong, broad-based planning in anticipation of the continued rise in sea levels we are in danger of losing more than historic structures. With tourism the largest industry in Maine, without planning and strong action, we make ourselves economically as well as physically vulnerable. Historic preservation, in conjunction with other fields must collectively look forward and take measures to fortify the state to meet these challenges with innovative and collaborative action steps. A national conversation has begun, in the field of historic preservation with Newport, RI Restoration Foundation and the cities of Annapolis, MD and Alexandria, VA among others leading the way. Discussions are focusing on what we can do, collectively, to protect our historic downtowns and neighborhoods from the inevitable rise of sea levels in order to develop smart local and state policies to protect entire communities. The future of our heritage, and the legacy we leave for generations of Mainers depends upon quick and progressive action.